This unusually large image of Bhagawan Vishnu shows the God in His standard pose: holding the chakra and conch in His upper hands, with His lower right hand making the gesture of reassurance. The lower left hand is posed slightly away from His hip, palm facing down and resting on His mace. The Lord stands on a lotus pedestal, a cushion shaped seed pod at the top with downward pointing petals below. His face is youthful and sharply carved. Bhagawan Vishnu is always shown dressed as a prince, with a tall crown and a great deal of ornaments covering His body. The prominent halo behind His head confirms His status as the Supreme Lord. 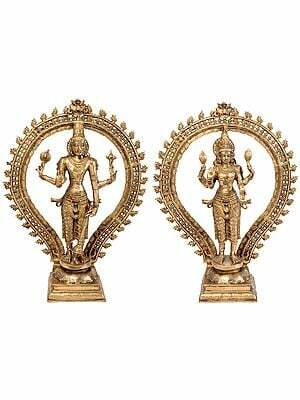 If we examine images of other Hindu gods and goddesses, we find that most appear in a swaying posture called tribhanga (posture with three bends), with the weight shifted so that one hip juts out slightly. By contrast, the primary form of Vishnu is usually shown standing straight and unbending. This posture reflects the God’s role as the axis sustaining this world. It is however a testament to the sculptor’s skill that he has managed to make Bhagawan Vishnu here look extremely lively and graceful, despite the potentially rigid stance.